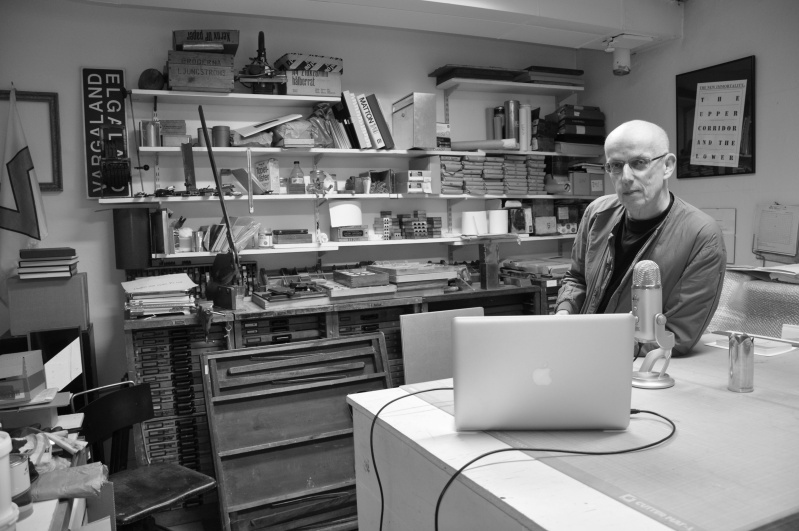 Jacquelyn Davis met with Leif Elggren one icy morning in his Hägersten studio in Stockholm. Elggren shared one of his previously published works of literature, titled Genealogy, within the context of a directed discussion. If the photograph above is examined closer, a small crown made from a tin can sits on the table to Elggren’s immediate left. This talk was originally recorded on January 14, 2011. Leif Elggren is a Swedish artist who lives and works in Stockholm. Active since the 1970s, Elggren has become one of the most constantly surprising conceptual artists to work in the combined worlds of audio and visual. A writer, visual artist, stage performer and composer, he has many albums and books to his credit—solo and collaborating with other artists. Most of his books are published via Firework Edition. His latest release is Physiological Frequencies (displayed in Gallery Niklas Belenius) which is a selection of his drawings and writings. In 2005, Elggren published Genealogy, a book about the suspension of time and space, the future, and the possibility to move along all coordinates simultaneously. He is also working on another book, titled Seeing in the Dark. To access the Am-Scand Lit archive, go here.